An artist's interpretation of Japan's planned GX medium-lift rocket, which is to be cancelled in 2010. Japan?s medium-lift GX rocket has been targeted for cancellation by a governmental advisory committee set up by Japan?s ruling party to eliminate wasteful spending from the nation?s budget for the year ahead. The Government Administration Reform Committee, meeting Nov. 17 in Tokyo, recommended that funding for the rocket?s second-stage liquid natural gas-fueled engine, which is being developed by the Japan Aerospace Exploration Agency (JAXA) be halted due to rising costs and no clear need for the GX. In reviewing JAXA?s budget request for a further 5.8 billion yen ($65 million) for the budget year that starts in April the committee noted that projected development costs had grown to 70 billion yen. When research on the GX rocket?s novel second-stage engine began in 2003, JAXA anticipated that developing the rocket would cost 45 billion yen to develop and would be ready to launch in 2006. The rocket?s inaugural launch was pushed back to 2011 when JAXA disclosed in 2006 that the second-stage engine required a major redesign and that its development costs had more than doubled by 2006, from 16 billion yen to 35 billion yen. The GX rocket is being developed by a partnership between JAXA and Galaxy Express Corp. of Tokyo, an industrial consortium led by Japan?s Ishikawajima-Harima Heavy Industries and Lockheed Martin Corp. of Bethesda, Md. The rocket?s first stage is powered by the Russian-built RD-180 engine, the same engine that powers the first stage of Lockheed Martin?s Atlas 5 rocket. 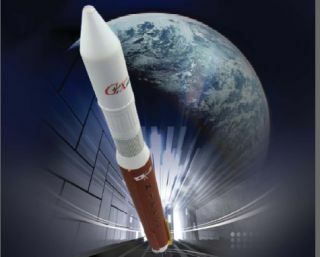 The GX originally was aimed at the commercial launch market, but with the success of Japan?s mainstay H-2A rocket and the poor commercial market outlook for the GX, the Government Administration Reform Committee said it makes sense to cancel the over-budget engine development program. A final decision is expected before the end of December, by which time the budget request for the following year is usually decided. JAXA spokeswoman Satoko Kanazawa said Nov. 18 that the agency had no comment on the recommendation to terminate GX.